Few dogs are more fun to own than German Shepherds, as they can serve a variety of purposes. For example, a German Shepherd can be the perfect family pet and protector; the ideal dog for service work; or the perfect dog for obedience or agility training. 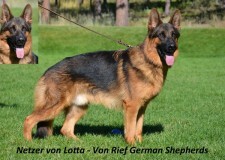 Von Rief German Shepherds offers AKC German Shepherd stud service in Colorado Springs, CO and throughout the United States. Our studs come from impressive lineages and have outstanding temperaments, diligence, attractiveness and intelligence. In addition, they have had their hips and elbows certified and are rated OFA good or higher. Furthermore, our studs are DM tested German Shepherds with clear results and will produce DM free German Shepherd puppies. 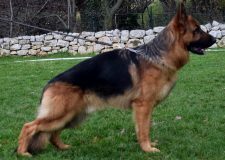 Regardless of the type of dog you need, a DM free German Shepherd from a reputable breeder will be the perfect pet for you and your family. If you have any questions, please do not hesitate to contact us.